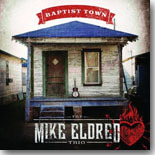 I’ve enjoyed previous releases from The Mike Eldred Trio, especially their previous album, Elvis Unleaded, but to these ears, their latest release, Baptist Town (Great Western Recording Company), is their best and most ambitious effort to date. Recorded at the legendary Sun Studio in Memphis, the new album features Eldred (guitar/vocals), John Bazz (upright and electric bass), and Jerry Angel (drums/percussion) with assistance from several artists familiar to blues/roots fans. Baptist Town, which takes it’s title from the name of the small community where Robert Johnson was murdered in 1938, includes 13 songs, 12 originals and one cover. It’s part of a bigger project which will culminate in a full-length documentary that will go behind the scenes of the recording of the album and discuss the history and continued issues in the South, and is part of an effort to persuade the U.S. Department of the Interior to recognize Baptist Town as a National Historical Landmark. The album is a diverse mix of electric and acoustic blues and roots music. There are plenty of rootsy rockers like “Hunder Dollar Bill,” “Sugar Shake,” “Hoodoo Man,” and the menacing “Kill My Woman” that showcase the trio’s big sound (plus harmonica from John “Big Nick” Samora on “Hunder Dollar Bill”). Also in the rocking vein is “Black Annie,” which starts out innocently enough as a stripped-down acoustic number before transforming into a speaker-shattering rocker. The thundering cover of the Beatles’ (yep, you read that right) “Can’t Buy Me Love” is a standout, too. My pick for best cut would be the sobering title track, a fantastic tune made even better thanks to guest Robert Cray’s distinctive stinging lead guitar. John Mayer guests on the tender ballad, “Roadside Shrine,” playing lap steel and electric guitar. Los Lobos’ David Hidalgo adds accordion and backing vocals to “Bess,” an interesting Tex-Mex-styled tribute to Bessie Smith. “Run Devil Run” is a Delta roller that teams Eldred’s National steel guitar with James Pennebaker’s mandolin and tap dancing from Lauren Brown. There’s plenty for blues and roots fans to savor on Baptist Town. This album is the prime jewel in The Mike Eldred Trio’s musical catalog to date.